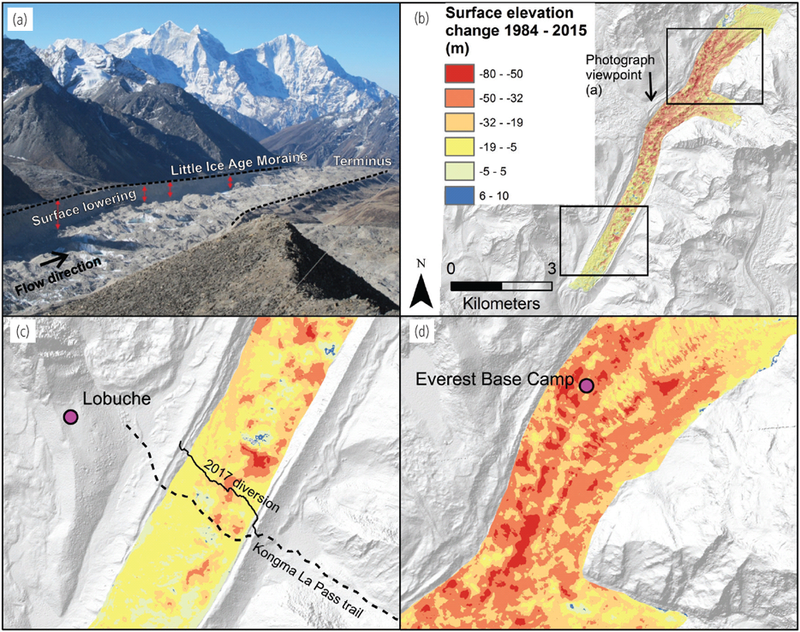 A new open access paper by Scott Watson and Owen king reveals the implications of glacier thinning on mountaineering and tourism in the Everest region of Nepal. 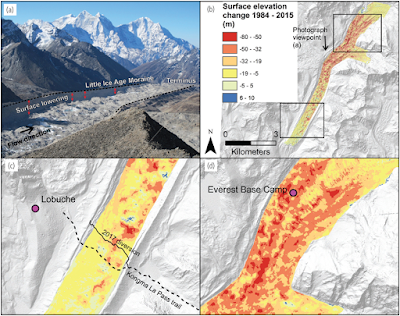 Parts of Khumbu Glacier have thinned by up to 80 m 1984−2015 and over 197,600,000 m³ of ice melted over study period, which is approximately 71,000 Olympic size swimming pools worth of water. As the glacier slows down and this water increasingly ponds on the surface, access becomes difficult for trekking routes passing over the glacier surface, such as the Kongma La Pass trail. The paper also includes observations from several Everest mountaineers, suggesting that rockfall activity is likely to increase in the high-mountain environment as snow and ice melts from mountain slopes, requiring changes to climbing routes on the world's highest peaks. 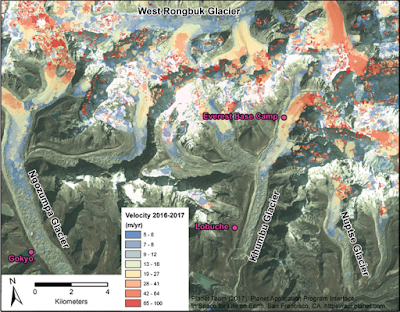 Glacier velocity in the Everest region derived from feature tracking on two Planet Labs satellite images. The lower parts of these glaciers are stagnant. The Kongma La Pass trail is rerouted around supraglacial ponds and ice cliffs, which block access. Few such ponds existed in 1984 (left panel).